Talk & Play #12 took place on April 15 2015 at Supermarkt, just like the previous edition, and attracted almost 200 people – the record so far! 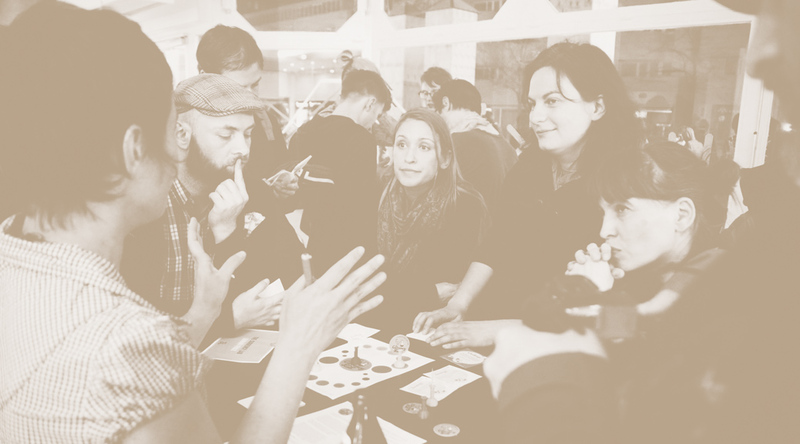 Since the event took place the week before the International Games Week Berlin 2015, I decided to do things a bit differently (to offer some variety to people attending both events) and have a selection of non-technical talks, two of the focused on analog games. Lenara Verle presented The Currency Lab, a board game created as a way to interactively learn the basic concepts of currency design: just like in real life, the path to a successful new currency (Euros, Bitcoins, Frequent Flyer Miles…) entails many challenges that must be overcome by choosing and creating strategies. Stephie Theodora mapped out her journey from fan girl to intern to game designer at Wooga in her talk “Breaking into the Gaming Industry” – a crash course in pursuing one’s dream without any contacts or design school certificates. Alfred Ladylike played her new song The #Femcrunch Blues (inspired by The Curious Expedition) and gave a lightning talk to share some personal anecdotes related to sexism in the gaming industry. During the second part of the evening all Talk & Play attendees have the possibility to show their games for people to play. Here’s the list, if I’ve forgotten yours let me know! A big thank you to: Tristan, Beatrice & Luca S (for their help making things run smoothly during the event), Nomi Nanako (for recording the talks on a very last minute notice), Julian Dasgupta (for all the wonderful pictures, including the one on top of this page – if you want to use any of them remember to ask him first! ), the lovely Supermarkt team. The next Talk & Play is going to take place on Wednesday, June 17th: you can already RSVP on meetup.com and Facebook.